Indeed. How weird that some of us live to 83, and some live only to 56. This is one great story, as has been said. It's truly amazing how one life affects another, and then millions of others. This is a beautiful story, even if it is one about a death. I hope he rests in peace. This is the reason I’m an Apple user, the intersection of art and technology. Microsoft, Google, Samsung have no class. Jobs was right. That's why people who don't get Apple's foray into fashion don't really get Apple, and also don't really get what Fashion is, intersection of Art and Identity. Apple did Art - Tech - Identity intersection; going into fashion is basically going into a business they were already in. The whole 1984 commercial, was about tech being used to enrich life, reflect it, not subjugate it. This is part of a general anti-intellectual current, except this one mainly expressed by a particular type of eggheads that are fan of Android/Microsoft. Wonder if his surname's similarity to renaissance calligrapher Giambattista Palatino influenced his career choice. Hate to pile on, but it is precisely that which gave us the Clippy, the Zune and Milk Music. Hearing where the design influences for Apple originated, especially when tracked back to a single person, time, and place is amazing. R.I.P. and fu*k the copycats. I still find it amazing the influence this man had on computing, thanks to Steve Jobs being there to receive that influence. I love stories like this, those unsung heroes that shaped the world we live in yet, we do not know who they are or were. How many are out there who had a major influence on someone who is in the spotlight of history yet go unheard of. had the ability to use proportionally spaced fonts but shipped with very few fonts. That one has Classic, Modern, Titan, Bold, Letter Gothic, Scientific, Scientific Thin and Xerox fonts, most of which appear to be monospaced. It had a proportional font in the UI, the letter 'i' takes up a smaller width than the other characters. These machines were geared at businesses and hit a very high price point. Some of the people involved with those machines went to work at Apple to develop the bitmapped UI of the Mac and Lisa. 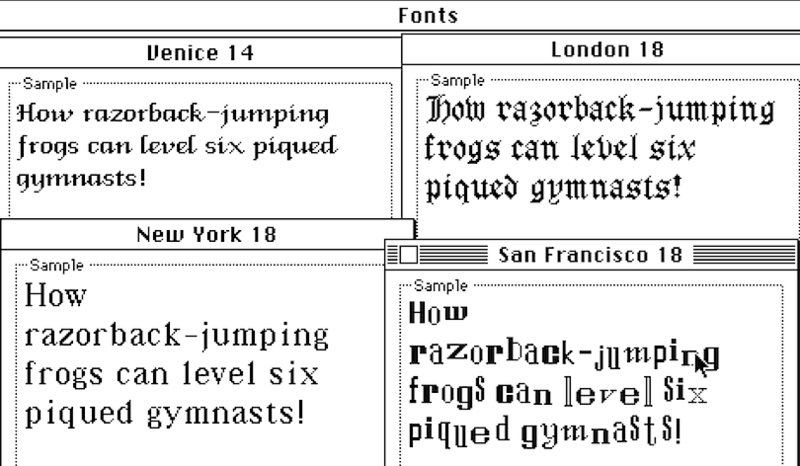 "Others at Apple Computer, due to their limited perspective on the utility of the personal computer, could not relate to Steve Jobs’ insistence on the font library; they considered it a distracting personal obsession. In his biography of Jobs, Walter Isaacson quotes Apple investor and partner Mark Markkula: "I kept saying, 'Fonts?!? Don’t we have more important things to do?'" It's not only about being able to recognize the existence of things but their relative importance, to emphasize the creative as much as the technical. This ultimately led to the desktop publishing industry. People like Woz who focused on engineering wanted to push the Apple 3 with its text-based UI. If it had been left up to Xerox pushing machines to businesses and engineers who only cared about technical ability, who knows how long it would have taken for this creative ability to reach a wide audience. Similarly, without people like Robert Palladino who lived their lives dedicated to their art, people don't learn to respect creativity. People only learn this by seeing the results of their work. The people who work at Apple have a similar obsession and it's fortunate that the company is set up in a way to allow them to express that in order to be able to influence billions of others.